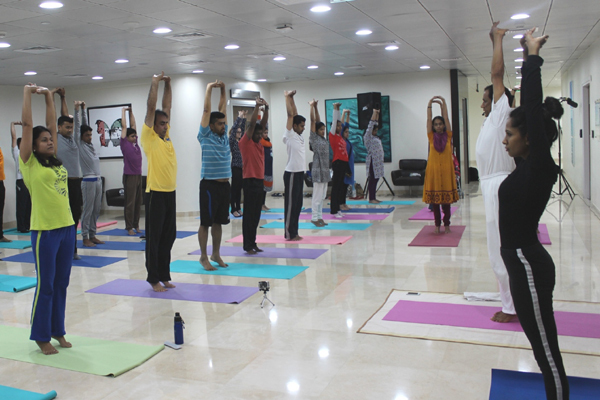 Dozens of nurses, doctors, admin officers and their families took part in a new ‘Happiness with Yoga’ session recently organised by Dubai-based Zulekha Hospital as part of its commitment to boosting its staff health and wellbeing. Leading up to the celebrations of International Yoga Day, the session was delivered by Augustine Joseph, a well-known yoga instructor, awarded with the Certificate of Honour from the Institute of Naturopathy and Yogic Sciences in Bangalore, India for his outstanding contribution in promoting yoga, the hospital said. Joseph shared his knowledge and passion for the practice alongside Afreen Khan, marketing executive at Zulekha Hospital and a yoga enthusiast. Together, they demonstrated to the hospital staff, their partners and families twelve easy sun salutation poses, and practiced laughing, clapping, and meditation techniques that can be done at a workplace to help improve concentration while decreasing stress levels. Celebrated globally, International Yoga Day was originally proposed in India with support from 175 United Nations member states before becoming officially established by United Nations General Assembly (UNGA) in 2014. It has been observed in the UAE since, and numerous official organisations, such as the Indian Consulate at the Dubai World Trade Centre will hold yoga sessions this year.